Following on from the great success of our November Clothes, Cloth and Culture Group focusing on the new publication Cultural Threads we’re pleased to share details of the official book launch at Central Saint Martins on Saturday the 7th of February. 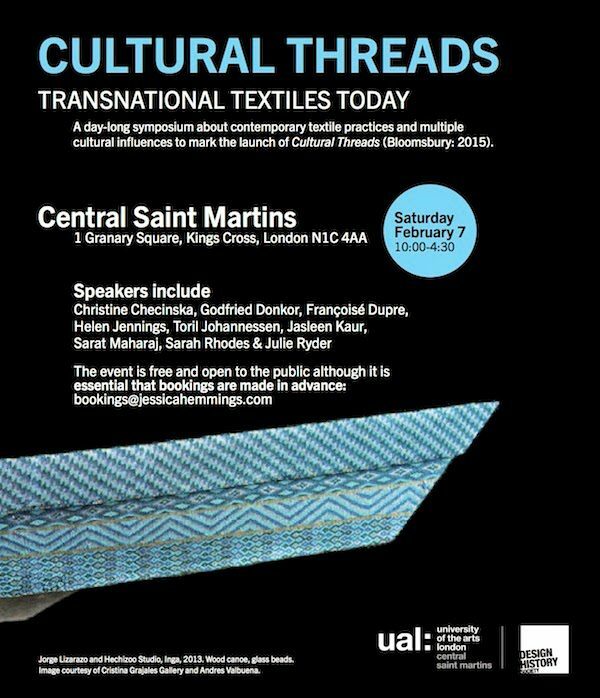 A day-long symposium about contemporary textile practices and multiple cultural influences to mark the launch of Cultural Threads (Bloomsbury: 2015). Speakers include: Christine Checinska, Godfried Donkor, Françoisé Dupre, Jessica Hemmings, Toril Johannessen, Jasleen Kaur, Sarat Maharaj and Sarah Rhodes. The book features a chapter from Christine Checinska, currently Library Animateur at the Stuart Hall Library. Recordings of our November event can be found here.